A visit to Mexico City is a grand experience any time of the year, exciting and culturally satisfying. But our summer is a long one and offers unique opportunities for outdoor activities. The sun is hot, the sky is blue, and the city sizzles. Come on down! The sixth annual Feria de Culturas Amigas 2014 overtakes the Zócalo from May 17 to June 1. From 11 am to 8 pm daily the unique, creative booths will show off the culture, history, gastronomy, and artisan crafts of more than 80 countries. Taste local cuisines (everything from meaty gyros from Greece to yummy noodles from Vietnam), purchase crafts, enjoy dance and music, and talk with natives who have travelled many miles to visit our city and country. This fair is a lot of fun. To avoid huge crowds, go during the week. Other years the fair has been held on Paseo de Reforma between Insurgentes and the Diana sculpture, which created complex traffic problems, so the switch to the Zócalo should be a good move. Go hungry, as the food is great, and take some extra pesos to buy a ring from Russia or a beautiful bag from Thailand. The most delightful outdoor terrace is at the restaurant El Mayor, which overlooks the prehispanic Templo Mayor and the Zócalo. Located at Republica de Argentina 15, it’s on the corner of that street and Justo Sierra, second floor (look for the Libreria Porrúa on the first floor). The view is spectacular and the food a Mexican fusion. Offered are a good variety of pasta dishes, soups, salads, appetizers including duck tacos, and main dishes. Next to the restaurant is a cafeteria if you just want to stop for a drink. Open from 9:00 am to 6:30 pm Monday through Saturday and 10:00 am to 6:30 pm on Sundays (yes, there’s an excellent breakfast menu too), this is an ideal place to stop to rest and rejuvenate while touring the cathedral, National Palace, Templo Mayor, and Zócalo. Best-known for the trajineras (gondolas decorated with flowers or bright paint) that travel the canals of this prehispanic community, Xochimilco was an independent settlement until the 20th century, now a part of the city south of Coyoacan. 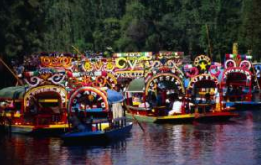 It is characterized by a system of canals over which the trajineras float, carrying tourists and locals alike. These canals remain from the vast lake and canal system that covered most parts of the Valley of Mexico, the main form of transportation in prehispanic times. Sunday is the big day for locals to take their families to Xochimilco, so it’s more crowded than during the week. You can buy food, drinks, and even plants from other trajineras traveling along the canals, and there are even tables and chairs provided on the trajineras. Request a tour from one to four hours in length. To get there on public transport, take the Metro to Taxqueña station, and then hop on the tren ligera. Don’t miss this! From April to August, Mexico City’s team, the Diablos Rojos, thrill fans with their fine base running, hitting, and pitching. They play at Foro Sol, located near the airport. Metro Stations Velódromo and Ciudad Deportiva are a few short blocks from the stadium, or you can always take a taxi. Most games begin at 7:30 pm Tuesdays through Sundays, but check the Diablo’s website (diablos.com.mx) for the schedule to be sure they’re at home. The Mexican League is a fine one, with many players who began or ended their careers in the big leagues up north. Best of all, it doesn’t cost an arm and a leg to take the family. The most expensive ticket is 70 pesos, about $6 US, and every seat is a good one. Instead of a traditional hot dog, enjoy the ever popular tacos de cochinita pibil (35 pesos for three tacos, about $3 US). Then sit back with your food and a beer and enjoy the shenanigans of the Diabos’ mascot Rocco. PLAY BALL! Only on Saturdays! You need lots of energy for this day, a bombardment of color, texture, music, and conviviality and an array of sights, smells, and sensations. As you approach the plaza, look for the plethora of easel artists in a small park and as you walk on the cobblestone streets past a beautiful building don’t miss the small shops on the street. On the other side of the building yet another park is filled with artists and artisans. There is street food, plus restaurants and cantinas serving beer and food surround the building. Once inside, don’t miss the Bazaar Sábado, one of the most famous artisan markets in Latin America. Here you will find original crafts and their creators, eager to share with you their techniques and expertise. The bazaar covers two floors, so don’t miss the upstairs, especially to see the huipiles. There’s also an outdoor restaurant inside the Bazaar Sábado which serves a delicious buffet of Mexican delicacies. Music is everywhere, and each new Saturday seems more festive than the last. While in the area you may want to visit Diego Rivera’s studio, close to the bazaar. If you’re feeling even more energetic, stroll over to Coyoacan (or grab a taxi for a short ride) to see Frida’s Blue House and the Trotsky museum. The Viveros de Coyoacan are close by for those who want to get away from the crowds and stroll, run, or jog through the grand park, filled with trees and vegetation. The Plaza Jacinto is located in colonía San Ángel on Revolución and Avenida de la Paz, just a few short blocks from Metrobus stop La Bombilla.